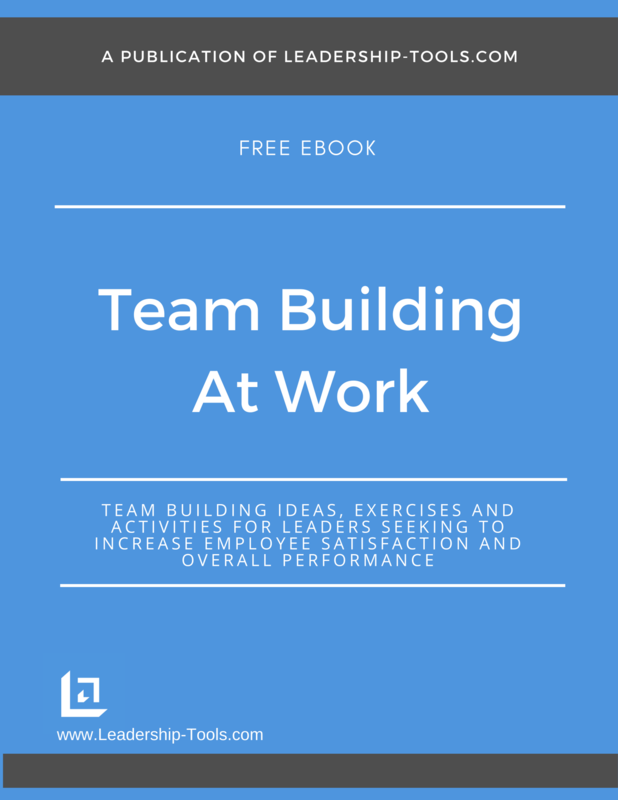 Our free team building exercise guide is available as an eBook, entitled Team Building At Work. Leaders must teach and coach their team members on a variety of professional topics. In this chapter we'll discuss the benefits of using tact and diplomacy in the workplace. Some people seem to be able to successfully navigate their way through the most difficult kinds of discussions imaginable. These folks understand that it's truly not what you say, but how you go about saying it, that gets that person to agree with what want. They are especially skilled at finding ways to negotiate win-win solutions that quickly diffuse a potentially difficult conversation. Leaders who can listen closely will key in on the root cause of frustration and quickly take ownership of how they can eliminate the "spur" that is stuck in the person's proverbial saddle. Leaders who use tact and diplomacy in their communications earn trust and credibility by their team, co-workers and supervisors. They become known as well polished and thoughtful leader. "Leaders who are tactful and use diplomacy effectively are almost always very strong listeners." Using tact and diplomacy means taking into consideration a persons feelings when communicating bad news. Without Tact: "I think it was clear that you did not prepare well for the meeting and I am disappointed in your presentation. With Tact: "I know you want to do a great job, and I think the presentation went well in several areas. There are a couple things that I would like to work with you on to fine-tune the presentation. However, before I give you specifics, how do you think you did, and in hindsight, what if anything would you have done differently? 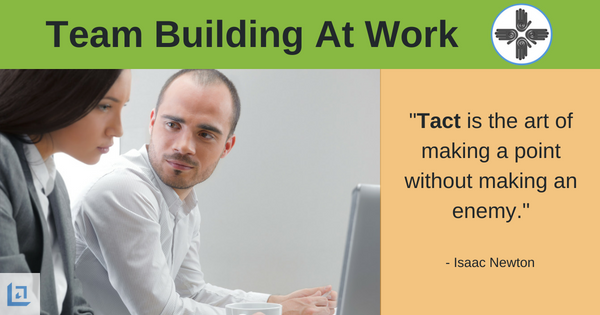 While it's true that using tact can take a bit more time, the outcome pays much greater dividends than simply being harsh and running the risk of your people feeling demoralized. Use the following free team building exercises to teach people the art of using tact and diplomacy. Purpose: Using this free team building exercise, teach your team about the power of suggestion and the importance of thoughtfully choosing the words they use. Their words carry great influence on co-workers and their customers so it is important they understand their responsibility of using words that are tactful and diplomatic. Explanation: Leaders can often underestimate the impact (both positive and negative) that their words can have on a group or an individual. Share with your team the following excerpt that was originally published in 1911 by Dr. Orison Swett Marden. This excerpt illustrates the fact that our words can have significant influence on those we lead, or those whom we come in contact with. We little realize how much suggestion has to do with health. In innumerable instances people have been made seriously ill, sometimes fatally so, by others telling them how badly they looked, or suggesting that they exhibit symptoms associated with a dreaded disease. A prominent New York businessman recently told me of an experiment that the friends of a robust young man made upon him. It was arranged that beginning in the morning, each one should tell him when he came to work, that he was not looking well. They did this subtly, in a way that would not make the man suspicious. At one o'clock this vigorous young man had been so influenced by the suggestion, he quit work and went home ill - thoroughly convinced he must be sick. To be sure, we are under the influence of suggestion every moment of our waking lives. Everything we see, hear, feel, is a suggestion, which produces a result corresponding to its own nature. Its subtle power seems to reach and affect the very springs of life. It is almost impossible for a patient to get well while people are constantly reminding him how ill he looks. What people need is encouragement, uplift and hope! Instead of telling a friend in trouble that you feel sorry for him, try to pull him and help to restore his energy and reserves. Help the friend picture his ideal image, his better self. The suggestion that comes from an enthusiastic and optimistic person can move mountains. Many a life has been stirred and inspired by only a few moments of positive conversation. Many men and women have made their place in history, largely because their ambition was aroused by suggestion: some book or some individual who gave them the first glimpse of their possibility and potential, and enabled them to feel for the first time a thrill of the power within them. As leaders, we can identify people throughout our careers that have helped us along our journey. As this free team building exercise suggests, we need to take the extra step each day to provide team members with words of encouragement and support. If you have an employee who is still not quite producing to the level you expect, recognize that employee for the effort they are putting forth and for any incremental improvement, before pointing out any shortfall. A balanced message and encouraging words can provide powerful motivation. Because your employees look to you for leadership. Understand that your words have the potential to either inspire the heart or dash the dreams of those who seek your approval. Use the preceding excerpt to lead a discussion with your team about how each team member is responsible for lifting the team up via their choice of words in the workplace. 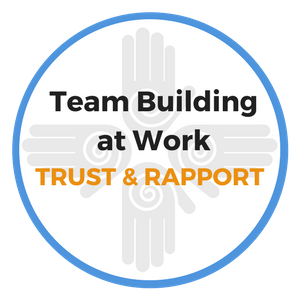 This free team building exercise can be of tremendous benefit for improving workplace moral. Lead your team in creating a list of words that are not acceptable in your workplace. Words such as "can't" and "won't". The final step in this free team building exercise is to have team members hold one another accountable for spending each day approaching new tasks with optimism versus doubt or fear. "You can have brilliant ideas, but if you can't get them across, your ideas won't get you anywhere." Purpose: To teach your team about how simply re-phrasing a question can gain an entirely different response or reaction. Tact and diplomacy depends upon your ability to choose quality questions. Explanation: In business, the word commitment is often overused and has become somewhat of a cliche'. In your next team meeting, instead of asking for every team member's commitment, ask "What are you determined to accomplish?" Simply by re-phrasing an over-used question you can shake things up and arouse your team's curiosity. Identify one key activity or end-result that each person is determined to accomplish. Be specific. Ask why this activity is important. What is the ultimate purpose? Ask if they are certain the task is achievable. Make sure the goal is realistic. If their stated goal is too broad, help to break it down into smaller tasks that can be effectively tracked and managed. Get clear on how their success will be measured. How will each team member know if their determination has paid off? Ensure that a time for completion is stated clearly. By end of week, end of month, etc. Does the above process sound familiar? Hopefully it does - you have just walked your team through setting SMART (Specific, Measurable, Achievable, Realistic, Time Sensitive) goals. The key point here is that you did this in a new and creative way that got your team thinking differently. Instead of mindlessly stating their 'tried and true' weekly commitment - they went a little deeper and considered more thoroughly their plan for accomplishment. Go ahead and pat yourself on the back. By adopting our free team building exercises, you're sharing valuable tools and leadership lessons with your team members. To download our Team Building At Work eBook, providing free team building exercises and activities, simply subscribe to our free newsletter. You will immediately receive a password that grants access to our entire leadership tools library.